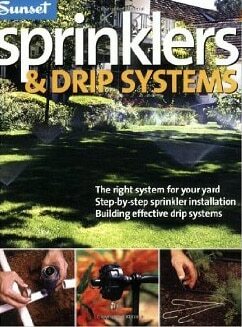 To figure out which types of sprinkler heads will work best in your yard, take another look at your garden plan. Make copies—one for each area—so you will have plenty of space to write down the number, type, and location of each circuit’s sprinkler heads. 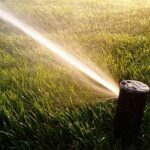 If you’re planning a combination sprinkler and drip system, plan the sprinklers first and then the drip system. You have plenty of options when it comes to designing your sprinkler pattern since sprinkler heads come in such a wide range of throw distances and nozzles. Begin planning out rectangular spaces, since irregular or curved areas are more of a challenge. You want to use as few sprinkler heads as possible in each area while still maintaining good coverage. More sprinkler heads mean more circuits, which will increase the overall cost of installing your system. Sprinkler heads should always be placed so that the sprays overlap—the distance one head throws should reach the head of the next sprinkler. This is called head-to-head coverage, and sprinklers should be placed equidistantly in each zone to achieve it. In rectangular spaces, start by placing sprinklers in the corners, adding more along the perimeter if necessary. A 30-by-60-foot lawn, for instance, can use 30-foot rotors in each corner and in the middle of each long side. For less easily divided dimensions, place a sprinkler head in the corners and work out the fewest number of heads for each long side based on how far the spray heads or rotors throw. Put a sprinkler head in the middle of the lawn if the area is wider than the sprinkler heads can throw. 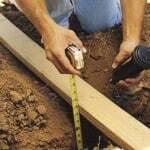 Odd-shaped areas require a little more fine-tuning. Use sprinkler heads that have adjustable-pattern nozzles; you may have to add a head with a different spray radius to fully cover the area. If you can’t eliminate overspray, reduce it as much as possible and make sure it won’t damage fences, your home’s siding, or other surfaces that shouldn’t be exposed to excessive moisture. Specialized nozzles that throw water in a rectangular pattern rather than in an arc can be used to water narrow strips of lawn. A side-strip nozzle is used on the long end of a strip, a center-strip nozzle is placed in the middle, and a corner-strip nozzle in the corners. For a strip such as the one between the sidewalk and the street in front of many houses would only need one side strip and two corner strips. Strip-pattern nozzles can cover areas 4 or 5 feet wide and up to 30 feet long. Installing sprinklers in an established landscape requires careful mapping and measuring. Start by drawing an irrigation layout to scale, showing where you plan to place pipes; work around tree roots and hardscaping as much as possible. It’s not necessary to install the whole system at once—you can spread the work out over a few weekends, installing one circuit at a time. Once your layout is complete, go out into your yard and mark sprinkler head locations with stakes or flags. 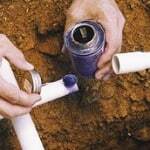 “Connect” each sprinkler head with paint, chalk, or string wrapped around the stakes or flags to map out pipe locations, including the water supply pipe, control valve locations, and where you’ll need to dig a trench for the wiring between timers and valves. To make sure your marked lines match your irrigation layout, go back and re-measure the distances between sprinkler heads. 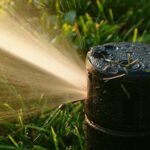 Sprinkler heads should be spaced correctly to water each area thoroughly but without wasting water.